Finished Apr 2018. Final score: 4 / 5. I enjoyed book 1, and book 2 was well-reviewed. This is an amusing spy novel set in 1930s England that is worth your time if you enjoyed Book 1. It is difficult being B-list nobility. Her Ladyship Georgie is 22 years old, 34th in line to be the queen, and is flat broke. Though she has no debt, she has no cash-flow to sustain herself. She is stuck living by herself eating beans in a beautiful house in London. Perhaps debt just wasn't an option back in the early 1930s? Not sure. Forbidden by her rank to do real work, to get by, she cleans houses pretending to be a lowly maid employed by her own company. It's all very amusing, though this quirk is not the focus of this novel. Her brokeness is. For book 2 of this cute series, Georgie must entertain the princess of Bavaria for a couple weeks. How does one entertain royalty with no money? The Queen gives her a difficult task (show the princess a good time), and Georgie acts like she was given an white elephant. She's too proud to ask the Queen for money. This predicament gave me a thought. Is one truly broke if they are good friends and family with the King and Queen? The Lady Georgie called in some favors and made it happen. It just goes to show that who-you-know can be just as if not more important than your bank account. The working class trades with money. The nobility trades with favors. Princess Honey from Bavaria arrives, and she is very amusing. I won't reveal more. Her outcries are a frequent source of amusement in the novel. The bodies start dropping, and the story finally turns in to the period spy novel I was wanting. Like the last book, the Queen is not impressed with Scotland Yard and asks Georgie to poke around for clues on her own. How Georgie manages to so easily escape her entertainment duties and dash around England so quickly during pre-WWII... I thought that was a bit of plot hole. The other characters say: "Ah, I thought you forgot us..." My thought process: This book had 2 days worth of events and pretended it was just 5 hours. Overall, this book was very enjoyable. It is a bit of "Roman Holiday" mixed with a touch of whodunit. All the story arcs were wrapped up nice and neat at the end. I plan to pick up book 3 soon. 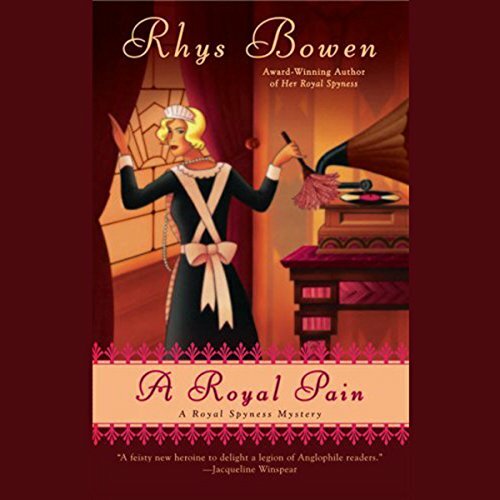 Discuss A Royal Pain (Book 2) in the forums.